Virgil, Ovid, Cicero, Horace, and other authors of ancient Rome are so firmly established in the Western canon today that the birth of Latin literature seems inevitable. 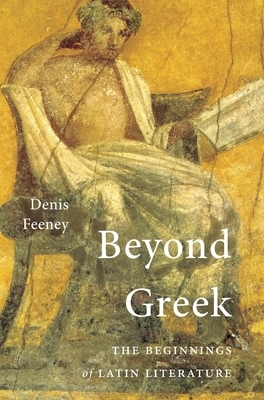 Yet, Denis Feeney boldly argues, the beginnings of Latin literature were anything but inevitable. The cultural flourishing that in time produced the Aeneid, the Metamorphoses, and other Latin classics was one of the strangest events in history. Beyond Greek traces the emergence of Latin literature from 240 to 140 BCE, beginning with Roman stage productions of plays that represented the first translations of Greek literary texts into another language. From a modern perspective, translating foreign-language literature into the vernacular seems perfectly normal. But in an ancient Mediterranean world made up of many multilingual societies with no equivalent to the text-based literature of the Greeks, literary translation was unusual if not unprecedented. Feeney shows how it allowed Romans to systematically take over Greek forms of tragedy, comedy, and epic, making them their own and giving birth to what has become known as Latin literature. The growth of Latin literature coincides with a period of dramatic change in Roman society. The powerful but geographically confined Roman city-state of 320 BCE had conquered all of Italy just fifty years later. By the time Rome became the unquestioned dominant power in the Mediterranean over the course of the next century, its citizens could boast of having a distinct vernacular literature, as well as a historical tradition and mythology, that put them in a unique relationship with Greek culture.